Swim platform is integral to the hull. Canadian-built AJR windows and frames. Entry to the salon is via a hinged stainless steel and glass door from the cockpit. Because of the sedan trawler design and the wide beam the salon is quite roomy, even though the boat has generous side decks. There are windows all around for great visibility, light and ventilation. The salon L-shaped settee is nicely upholstered in ultraleather, and has a high/low table for dining which also folds into a cocktail table configuration. The linear settee opposite pulls, Pullman style, to make a double berth. The U-shaped galley is forward port and features and Eno 3-burner propane range, and a 7 cu. ft. Nova Kool refrigerator/freezer. A microwave is opposite to starboard in a cabinet of drawers with a large countertop (maybe useful as a bar?). The starboard helm has a double-wide helm seat, and a pantographing door that opens to the starboard side deck. All-around visibility from here is excellent. Wood blinds in the salon operate within pockets so they are constrained with in a lowered position. The attractive master stateroom is in the bow, and has a pedestal-type bed with storage drawlers beneath. There are lockers around the stateroom, and two hanging lockers. Two overhead hatches and two opening portlights provide light and ventilation. The guest stateroom has a double berth, a stack of drawers, and a portlight for ventilation. The head is opposite the guest stateroom and has a separate shower enclosure. The flybridge and boat deck are enormous -- there is plenty of room for a sizeable dinghy. The flybridge has a nice L-shaped settee, triangular table, and two pedestal seats at the helm. A canvas flybridge cover is included. Cabin heat is from a Webasto AT55 diesel-fired furnace system. Isotherm 11 gallon electric hot water tank. The Bracewell 41 is the new and updated version of the highly-regarded Camano 41, and is built from the same tooling. This new 2019 Boat Show model adds many improvements to further enhance comfort, aesthetics, and confidence while cruising. Bracewell Yachts has taken the original Camano 41 design and created a more refined and luxurious two-stateroom model. This 2019 model has a Cummins QSB 6.7 480 hp engine, Onan 7.5 kw generator, bow and stern thrusters. Garmin navigational electronics, pantographing helm station door, and much more. The interior is light and spacious, and the cabinetry is lovely. As a sedan trawler, the open interior provides unequaled all-round visibility and an attractive, comfortable floorplan. The Bracewell 41 has the exclusive hullform that earned Camano yachts their reputation as seaworthy performance trawlers. With a unique keel and a low center-of-gravity, the Bracewell 41 cruises safely and efficiently at any speed from 8 to 17 knots, something neither conventional semi-displacement nor planing hulls can achieve. Top speed is 18 knots. 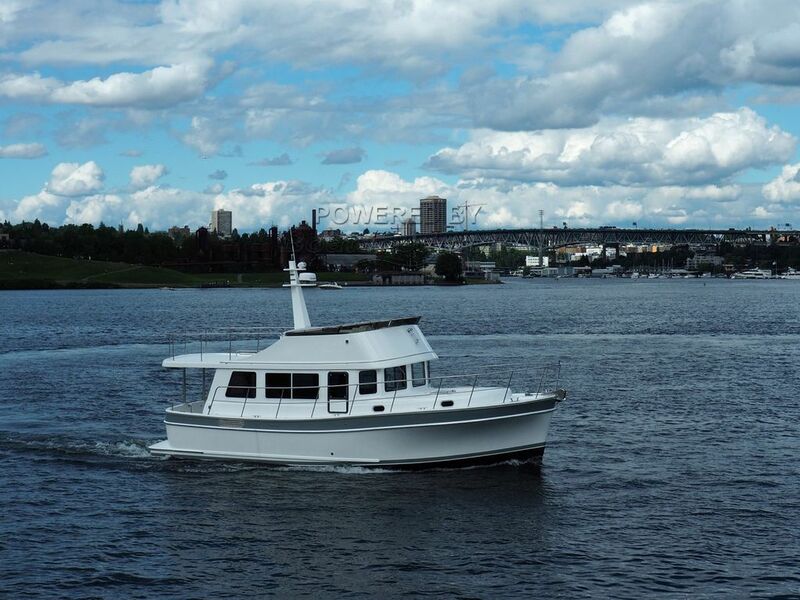 This Bracewell 41 Flybridge Sedan has been personally photographed and viewed by Scott Helker of Boatshed Seattle. Click here for contact details.